Image size, 20" x 13". O/A/ size, 24" x 17 ½"
An unusual subject. Many people don't realise the Whirlwind participated in the Channel Dash. 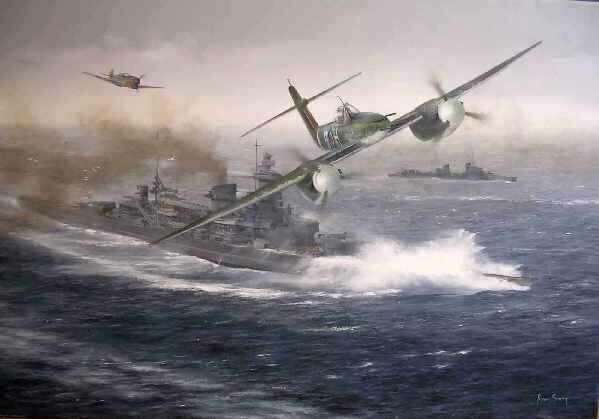 My print depicts the German warship Scharnhorst being overflown by a Whirlwind of 137 Sqn. Only two Sqns. were equipped with the type. The aircraft unfortunately suffered problems with the Rolls-Royce Peregrine engines and never fulfilled it's true potential. An element of the painting that interested me as much as anything in fact, was that of the Scharnhorst itself. One of the design shortfalls of the vessel was the fact that it spent a lot of it's time with the bow ploughing underwater as is seen in the image. A design rectification involving the fitting of a new bow, known as the Atlantic Bow, was supposed to solve this problem, but had little effect.